Editor’s note: This story has been updated after this morning’s TPS press conference. Multiple charges have been laid thanks to the efforts of multiple departments spanning two countries, stemming from 10 bomb threats. Thirty-six-year-old Justin Bagley of Elkville, Illinois has been charged with 11 counts of felony disorderly conduct in connection to a series of bomb threats made in the Town of Taber that spanned over three days. Class 3/4 disorderly conduct felonies can carry sentences ranging from one to five years in prison in the state of Illinois. The Taber Police Service, Medicine Hat Police Service, Jackson County police and United States Department of Homeland Security all participated in the investigation. Jackson County Sheriff’s office noted investigators were able to track the phone number used to call the targets in Taber, leading to the arrest of Bagley. All told, an international suspect was able to be arrested within a 72-hour time frame from when the first bomb threat was received on Thursday night at Wal-Mart in Taber. According to Graham Abela, chief for the Taber Police Service, Bagley accessed an online app which is used to listen to police scanners. Bagley would often listen to these from the United States but chose to attempt to spy on detachments from Canada. Bagley clicked on the Alberta tab from the app and selected Taber Police Service. Bomb threats were targeted at the Taber Hospital, four schools, CIBC, Wal-Mart and the police station itself. “By calling Wal-Mart, or locations he would know that would have larger amounts of people at them, obviously the response by police would be greater and there would be more radio traffic,” said Abela. The Taber Police Service accessed the help of Medicine Hat Police Service due to the expertise of one of its members in tracking the suspect down. L.T. Westlake Fine Arts Elementary School and the D.A. Ferguson/W.R. Myers school complex via an anonymous voice message received bomb threats early Friday morning. The police were immediately contacted and responded to the incident as per their protocols. Given the size of the D.A. Ferguson and W.R. Myers complex, and the fact that it was under ongoing construction, D.A. Ferguson, W.R. Myers students and Taber Mennonite School students who were at W.R. Myers were evacuated. Police determined there was no need to evacuate L.T. Westlake. The police were able to quickly determine there was no threat at Ferguson/Myers schools and students returned to regular classes by mid-morning. Early Friday afternoon at 12:08 p.m., Central School received a bomb threat. Students had already been dismissed for the weekend at that point given Fridays are half days at school, and were out of the building at the time of the threat. Taber Police Service searched the school, like the other threats, after which it was also deemed a hoax according to division correspondence. Bagley has a history of making bomb threats, having made one to a Wal-Mart he worked at in Du Quoin back in 2005, according to a report by the Southern Illinoisan. Bagley’s criminal record also includes a three-year sentence after pleading guilty to a charge of domestic battery back in 2014, where he violated a term of his probation. Where Bagley will be prosecuted, be it the United States or Canada, has not been decided yet. “Those are the things we are working through with Jackson County prosecutors. I can tell you, the legal system in the United States treats these things very seriously. I’m not sure it would be advantageous from our perspective to prosecute him here again in Canada, but that is an option that is on the table for sure,” said Abela. Reports of bomb threats had surfaced in various areas in North America over the weekend. While no direct link has been made as of now to Taber’s case, the Taber Police Service is co-operating with other agencies in sharing information. “We are examining our evidence to see if we can help any other investigators with incidences that are occurring in their jurisdictions,” said Abela. 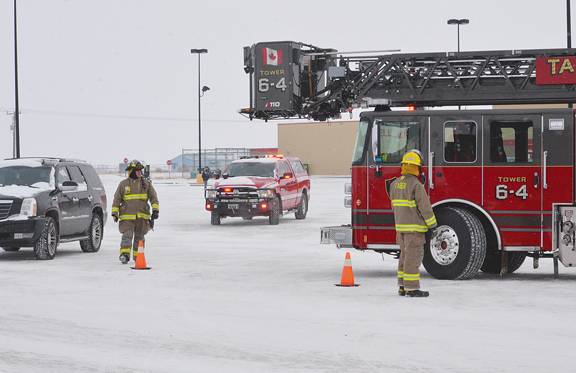 Along with the various policing agencies, the Taber Police Service was also aided by the Taber Fire Department while attending bomb-threat calls. Mobilization of efforts was also aided with the partnership TPS had with Horizon/Holy Spirit school divisions and the Taber and District Chamber of Commerce to notify what businesses could do if they had received a bomb threat. Businesses were asked to review their bomb threat procedures with their staff. If a bomb threat were to be received, to make a note of the time, phone number, and caller ID if available. After the phone call had ended, businesses were encouraged to hang up and immediately dial *57 and follow the prompts. After dialing *57 and completing the process, to call 9-1-1 and follow the businesses bomb threat procedure. With the bomb threats creeping into the double digits around Taber over an exhaustive three-day span, it can be trying for any police department not to get into a ‘Boy Who Cried Wolf’ mentality after several investigations have revealed the threats to be false. Chief Abela could not stress enough how serious the bomb threats were to the community, which affected the town in many different ways. Taber Police Service and Horizon Victim Services Unit has released information to the public on community stress management.